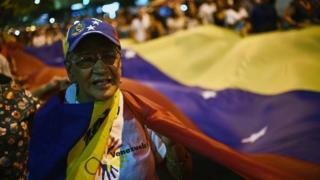 An opposition coalition won an overwhelming victory in Venezuela's legislative election on 6 December. For the first time in more than 16 years, it will control Congress. The newly elected lawmakers take up their seats on 5 January. What changes are likely to be brought about by this new National Assembly? Venezuela has a presidential political system. The president is the head of the executive. The National Assembly is the legislative branch. It consists of just one chamber with 167 members. President Nicolas Maduro was elected in April 2013 to a six-year term. Up until 5 January 2016, his party, the socialist PSUV, had a majority in the National Assembly, allowing him to pass laws smoothly and even allowing him to govern temporarily by executive decree. President Maduro will now face a National Assembly in which the opposition MUD coalition is in the majority. Venezuelan politics have hitherto been highly polarised and the opposition could hold up much of President Maduro's legislation. The likely result is going to be a power struggle between the executive and the legislative. How much power does the National Assembly have? The National Assembly can pass most laws with a simple majority (50% of the lawmakers plus one). Under Venezuela's constitution, the president only has limited powers to veto laws. The president can send laws back to the National Assembly, but the latter can override the veto with an absolute majority (half of those present at the time of the vote plus one). With a three-fifths majority, lawmakers can give the president the power to govern by decree, sack the vice-president and ministers and hire and fire members of the country's National Electoral Council. With a two-thirds majority, the National Assembly can remove judges from the Supreme Court and create a constituent assembly with a view to rewriting the constitution. The opposition MUD coalition won 112 seats in the elections on 6 December. That gives them a two-thirds majority, also called supermajority. However, since the election, the Supreme Court has suspended the inauguration of four lawmakers while it investigates allegations of electoral irregularities. Three of them are members of the MUD opposition coalition, the fourth is a member of President Maduro's PSUV party. Fifty-four pro-government and 109 opposition Assembly members were sworn in at the inaugural ceremony on 5 January. A day later, the opposition defied the Supreme Court order and swore in its three barred lawmakers. The former speaker of the National Assembly, Diosdado Cabello, said he would lodge a complaint with the country's top court. What changes does the opposition want to make? Opposition lawmakers said they would seek the release of dozens of politicians and activists jailed under President Maduro. Mr Maduro said he would veto any amnesty law, setting the scene for the first clash between the executive and the legislative branches. The opposition also said it would demand that the Central Bank release key data such as inflation figures but this move seems to have been thwarted by a last-minute change to the law made by President Maduro a day before his decree powers expired. If it keeps its supermajority, it could replace prosecutors and judges, but this is likely to take time. Venezuela's economy is in dire straits, suffering from skyrocketing inflation, shortages of some basic goods and dwindling revenue from oil. Opposition lawmakers have promised reforms but without access to key economic data, depleted state coffers and an executive with an iron grip on the finances it is hard to see how it can make sweeping changes quickly. One of Venezuela's main problems is its almost exclusive reliance on oil, the price of which has fallen sharply. Diversifying its production would be key to its recovery as global oil prices remain low, however this would not be a speedy endeavour in a country which has focussed almost exclusively on its oil production for decades. The opposition says Venezuela's problems have been further exacerbated by government mismanagement. But replacing personnel in state-run companies such as oil giant PdVSA would take time and likely encounter opposition from the executive. Many Venezuelans said they were prompted to vote for the opposition because of the shortages and endless queues they have to brave to get some basic goods. But lifting price controls, which many people say are to blame for the shortages, could turn poorer Venezuelans against their newly elected lawmakers. A reform of its strict currency controls would also be unlikely to be immediate. Will President Maduro remain in power? President Maduro's term runs until April 2019. However, once he is halfway into his term, from April 2016 onwards, a recall referendum could be held. Four million signatures are needed to trigger it and some opposition members have already threatened to seek such a referendum. President Maduro's predecessor in office, Hugo Chavez, won a recall referendum in 2004, but Mr Maduro's popularity has never been as high as that of his mentor.